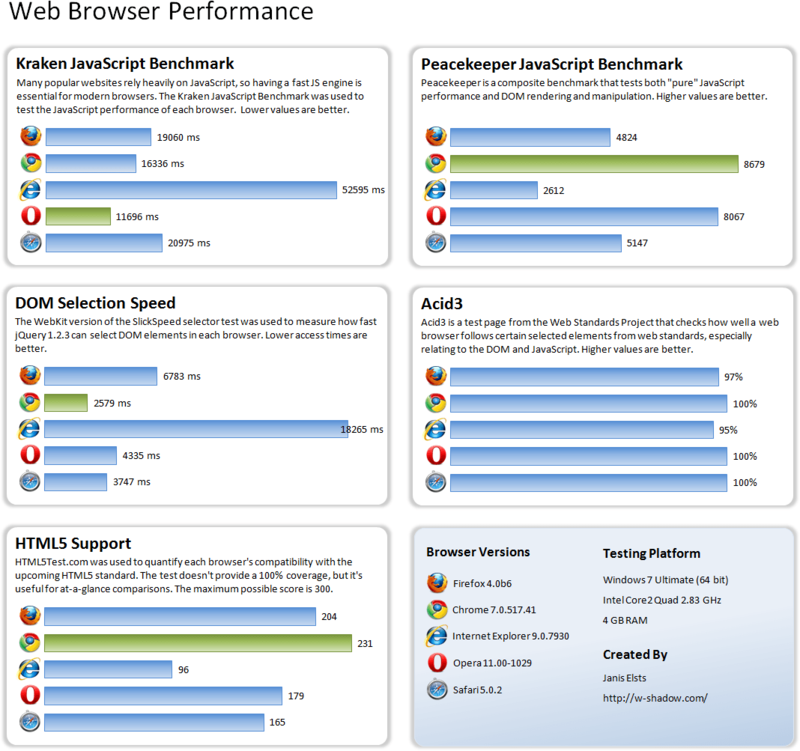 Note that this is a different set of benchmarks than what was used in the previous browser comparison, and the testing platform has experienced some minor changes. This means you can’t directly compare the above figures with the results from the previous post. This entry was posted on Wednesday, November 3rd, 2010 at 11:34	and is filed under Web Development. You can follow any responses to this entry through the RSS 2.0 feed. You can leave a response, or trackback from your own site. Nice comparisons! It’s amazing how all of the Browsers have improved over the last year or so! Any reason why you didn’t use the Dev channel of Chrome though? Considering you’re using the latest pre-release versions of the other browsers. Might improve Chrome’s results even more! I wasn’t sure how stable Dev is, so I used the latest version from the Beta channel. But you’re right, the Dev version is probably even faster. It’s hard to produce a completely fair comparison when different browsers use different naming and numbering schemes for their pre-release versions. I installed several web browsers ,IE, Chrome, Firefox, Safari. i have to say there is no best one. Chrome is the fastest and there are lots of plun-ins with FF. IE is great for online shopping as it is only browser supported by bank company. Cthulhu generated this page with 52 queries, in 1.002 seconds.